GST produces a long running series of stained glass pattern books and premium glass bevels. Use this free pattern with the GST bevel cluster GST25 and with GSTB4. 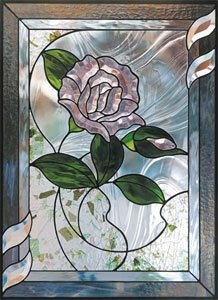 This beautiful stained glass rose will add grace and warmth to your home. Pros : Very Pretty , Love the color. Cons : Wish it fit better to Pattern.